We've been having some very chilly weather lately. The winds have been a little strong in the night as well. The peas and beans are all blown-over! Keeping warm until next time! 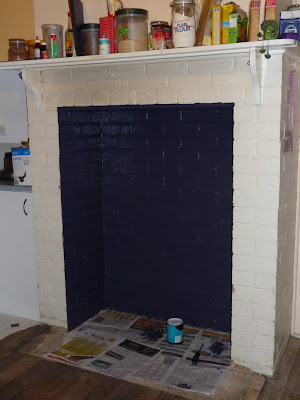 I love the colors you used on the fireplace. It looks very warm and inviting. I think it looks classic. Hurry up oven before you two freeze. I hope the peas and beans survived the wind. The gloss will fade with a bit of use too. Love the fireplace. Can't wait to see everything installed!